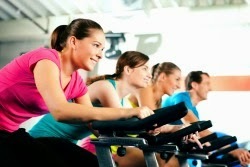 Boredom is one of the sneakiest sabotages to people’s goals of getting fitter or healthier in the New Year. It creeps in slowly, undermining their hard work and keeping them from progressing to their optimal health, leading to negative self-talk and decreased motivation. Don’t let this happen to you! Instead of throwing in the towel when you decide you just can’t spend another day doing the same exact routine as usual, or giving up when you aren’t seeing the results you want, try mixing up your schedule with these fun and fitness-boosting activities and classes. Walking — This low-impact, heart-rate increasing activity is good for just about any fitness level because of its ability to provide something for everyone. For the novice exerciser, walking is a good way to get muscles moving, burn extra calories, strengthen and tone the lower body and build stamina for other exercises. As a bonus, walkers can tone their upper bodies and increase their exercise gains by carrying hand weights or donning lightly weighted backpacks. Running — The ultimate full-body workout, running moves muscles that many people don’t even know they have. With plenty of plans available online to take beginners off the couch or advanced runners into ultra-marathons, running can be customized to every ability level and every goal. Not sure you could run for more than a few minutes? That’s okay, too! Many running plans start with Walk-Running or Run-Walking, allowing beginners to alternate running and walking in order to build up to distance running. Kickboxing — Incorporating many forms of martial arts, this empowering type of exercise trains your muscles to move in new ways, building new muscle, toning old muscle, increasing flexibility and giving you a great cardio workout. Dance/Zumba — A craze that has swept the world, cardio dance classes like Zumba are creating fun ways for people of all ages and ability levels to come together in the name of cardio workouts and fitness. Dance to fun and upbeat songs, memorize dance routines filled with fitness-blasting moves and get to know some new friends in the process. Pilates — A centuries-old tradition, Pilates incorporates low-impact muscle building and flexibility improving moves that tone the body and still the mind. Think of it as a slightly more intense yoga workout, in which slow movements are repeated in order to help build muscle and raise the heart rate. Yoga — While not nearly as cardiovascular-focused as other workouts, yoga has been proven to be the ideal “workout sidekick.” Most fitness classes build muscle through repetitive movements, causing those working muscles to shorten and tighten. Yoga works to lengthen those muscles, working out the kinks and helping to release unnecessary tension wherever possible. While it may seem like that would counteract the work from other fitness classes and activities, yoga actually aids in overall fitness as it helps the muscles to build in long, toned ways instead of short, stocky, bulky ways. Swimming — The perfect activity for those with mobility issues such as joint pain, lower body injuries or recent surgeries, swimming provides a stress-free alternative to exercises like running, weight lifting and walking. With many variations from which to choose, including lap swimming, treading exercises, kicking with a kickboard, water aerobics, water polo and many more, swimming provides a workout for all ability and skill levels. Tai Chi/Chi Gong — Like yoga, tai chi and chi gong provide a very low impact complement to exercise. Through deep breathing and long, slow muscle movements, exercisers the world over see their muscles elongate, their stress levels go down and their overall health and well being rise. Weight Lifting — You can’t lose fat without building muscle and weight lifting is a great way to do just that. Through repetitions of movements with a variety of shapes and sizes of weights, you can build up your muscles, toning them, creating greater strength and making yourself healthier in the process. Weight lifting can be geared toward any ability level, beginning with 1 or 2 pound hand weights and going up to extremely advanced movements with barbells. Boot Camp — A cardio extravaganza, boot camp-style classes do exactly what they seem like they should do: put you through an intense workout filled with body weight, weighted and cardio movements designed to work every single muscle in your body. While most classes generally offer beginner level modifications for boot camp moves, it is important to make sure that the class you are attending caters to all skill levels. Barre — A very low intensity workout, barre, or barre Pilates, utilizes props and small muscle movements to train specific muscle groups. Props like exercise rings, exercise balls, weights and more are utilized as aids to resistance training, most while holding onto a dance barre, working different muscles to create changes throughout the body. Interval Training — Interval training combines cardio with weight lifting, creating a mash up of exercises that raises the heart rate, builds muscle, burns fat and helps to transform the body. Intervals of activity (with or without weights) are mixed with intervals of rest to help people gradually build themselves and achieve their fitness goals. For additional information about the services offered by the Prenatal Diagnostic Center at the Harvey Institute for Human Genetics at GBMC, visit www.gbmc.org/prenatalgenetics or call 443-849-GBMC (4262). According to Mayo Clinic, at least half of the adults in the world snore sometimes. Snoring occurs when airways are blocked from tissues in your throat that relax as you sleep. When air passes through these relaxed tissues, it creates a vibration which in turn makes the snoring sound. This can be disruptive to the person snoring and his or her loved ones. People who snore regularly may suffer from obstructive sleep apnea, a condition in which breathing is interrupted numerous times during sleep. As a result, the brain and body may not get enough oxygen. This can lead to waking up many times at night, being tired throughout the day, having headaches in the morning or waking with a sore, dry throat. Men and people who are overweight are more likely to have obstructive sleep apnea, but it can affect anyone. Have a set sleep schedule. Try keeping to a schedule by going to bed at the same time every night. Stop smoking. Smoking may cause swelling and blockage of the upper airway. Maintain a healthy weight with diet and exercise. Snoring can be made worse by extra tissue in the neck and throat area. Cut your substance intake before bed. Drinking alcoholic or caffeinated beverages before bedtime may keep you awake. Sleep on your side or at a 4-6 inch incline. This helps to keep the tongue or other tissues from blocking your airway. Sleep in a comfortable environment. It is not only important to make sure that your bed is comfortable, but also your surroundings. Most people sleep best in areas that are not too bright, stuffy, hot or cold. If snoring persists, it may be time to consider speaking with a physician. GBMC offers sleep services and studies for adults who may be experiencing sleep problems. The studies are done in home-like environments and can provide information to the certified sleep technicians from Sleep Services of America and GBMC physicians. For more information about the Sleep Services at GBMC, visit http://www.gbmc.org/sleepcenter. A diagnosis of breast cancer is a terrifying reality to face. Unfortunately, the disease seems to know few boundaries, affecting women and men of all ages and ethnicities. According to the American Cancer Society, about one in eight women in the United States will develop invasive breast cancer during her lifetime. Why is a Risk Assessment Important? Ignorance is often described as bliss, but when it comes to breast cancer, knowledge is power. After an appointment with a physician, patients are presented with a complete picture of their odds for developing breast cancer at some point during their lives. The results of the assessment allow the physician to determine when it’s appropriate to begin mammograms for screening and whether the patient is eligible for more extensive MRI screening or genetic testing. In certain cases, the risk assessment result may signal the physician that a discussion about preventive breast removal surgery (prophylactic mastectomy) is worthwhile. During a lifetime risk assessment, the physician inquires about a number of standard personal health details like age, menopausal status, use of hormone replacement therapy (HRT) and parity, which refers to the number of children a woman has borne. He or she will also measure the patient’s body mass index (BMI) and take a family history of first- and second-degree relatives with breast or ovarian cancer, including their ages at the time of diagnosis. The physician uses a tool to assess the data and can discuss results with the patient during the same visit. 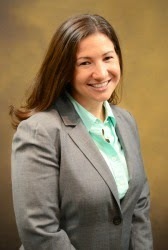 For more information on the services provided at the Sandra & Malcolm Berman Comprehensive Breast Care Center, visit www.gbmc.org/breastcare or call 443-849-GBMC (4262). Stir together nut butter, honey, orange zest, cinnamon and a pinch of salt. Add the protein powder and mix until fully incorporated. The mixture should be doughy and just slightly moist. If it is too dry, add water 1 tablespoon at a time until the desired consistency is reached. Roll the mixture into twelve 1-inch balls. 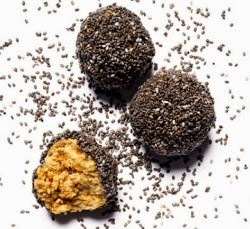 Place chia seeds in a shallow dish and roll the protein powder balls in the seeds.